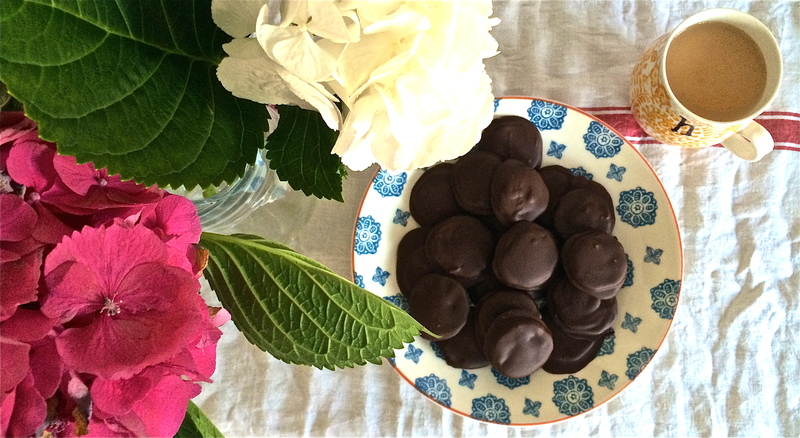 Peppermint creams may sound old-fashioned, but they’re a timeless classic that are perfect if you need to whip up an easy sweet treat. When you’re making a traditional recipe, Mary Berry is, in my eyes, the only person to consult. All hail Mary Berry! I won’t pretend peppermint creams are particularly healthy- they’re not at all- but in small doses and with good quality dark chocolate, they’re allowed every now and again! Start by sifting the icing sugar into a bowl. Add in the egg white little by little, and mix until you have a thick paste. Next add in a few drops of peppermint and knead it all in together. It should be nice and firm… if it’s too wet a mixture you will have to add more icing sugar. Bring it together to make a small ball. Place your ball of paste onto a sheet of baking paper, that has been dusted with icing sugar. Layer another sheet of dusted baking sheet over the top, and begin to slowly roll it out with a rolling-pin. Keep going until it is roughly half a centimetre think. Then grab a small biscuit stamp, and cut into circles. You can use a small bottle top if you don’t have a stamp! Leave the rounds to dry out on a baking sheet. You’re supposed to leave them to dry for about 24 hours according to Mary, but if you don’t have time for that (I didn’t!) a couple of hours will be fine. You just need them to be hard enough to dip in the chocolate! After you’ve let them dry, melt your chocolate. Heat a pan of boiling water, and pop the chocolate in a bowl over this, to melt in a bain-marie. Once fully melted, dip each peppermint cream into the chocolate. You can half dip them if you like, but I prefer them totally covered so they taste a bit like After Eights! Place each one on a baking sheet and leave to dry. Serve with a cup of tea and voila! Some tasty choccys that involve barely any ingredients and are super easy to make. They’re great to keep in the fridge to satisfy a sweet tooth in the evening, or even to serve at the end of a dinner party with a coffee. My Nan used to make these and they were always delicious. Love your rolling pin! Hi Tania… They’re such a great classic! Thank you 🙂 it’s my favourite kitchen implement!